Army veteran Sheriff Megan Holloway has a lot on her mind. 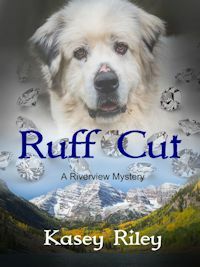 A dog with a belly full of smuggled diamonds, a terrified woman hiding at the Bailey’s Boarding House and a mafioso who is likely connected to both. What’s that city crook doing in her town, anyway? She saw Aaron, her boyfriend, flirting with another woman. Maybe he's begun looking for someone with less emotional baggage… Wondering if she can be what he needs, Megan knows she’s ready to try. Add to that, she relived her personal nightmare of the war in Afghanistan, again. Calling in the proper government agencies, Megan manipulates them, keeping control of the investigation in the background. Fortunately, she has an ace-in-the-hole the Feds don’t. The citizens of Riverview trust her and will help her any way she needs. Megan’s sting plays on the villain’s fear of snakes and ignorance of Colorado, giving them just enough information. The trap should be easy to spring, if she can just keep the Feds from interfering. The ranching town of Riverview is the backdrop, where your neighbors are your friends and can be counted on to help when times get tough, or dangerous.